A new clinical site at UW Medicine and Seattle Children’s will serve Washington, Alaska, Montana, Idaho and Oregon patients with rare or puzzling disorders. Some of the lead physicians at the new NIH Undiagnosed Disease Network site in Seattle. Front row, from left to right: Drs. Gail Jarvik, Katrina Dipple, and Fuki Hisama. Back row: Drs. Sirisak Chanprasert and Ian Glass. UW Medicine and Seattle Children’s will be part of the expansion of the National Institutes of Health Undiagnosed Diseases Network, the NIH announced today, Sept 24. The two Seattle institutions will become regional clinical sites in the nationwide program. Please see the NIH news release. The network was created to assist patients with rare conditions or whose disorders have proven difficult to classify. The Pacific Northwest regional clinical site will serve patients from Washington, Alaska, Montana, Idaho and Oregon. They can be of any age, from infants to adults. The clinical site directors are Dr. Gail Jarvik, professor of medicine, Division of Medical Genetics, University of Washington School of Medicine, and Dr. Katrina Dipple, director of medical genetics at Seattle Children’s and professor of pediatrics, Division of Genetic Medicine, at the UW School of Medicine. The latest grants will increase the number of network sites across the United States from seven to 12. The total, four-year funding for this phase is expected to be approximately $100 million. This second stage of the Undiagnosed Disease Network is extending the geographical reach of the program. In the predominantly rural Pacific Northwest and Alaska, an important aspect will be improving access for patients living in remote areas. Jarvik mentioned that, in addition to tremendous medical expertise, UW Medicine and Seattle Children’s bring a strong background in genomics research to the Undiagnosed Diseases Network . Genetic studies, she explained, are often the way that the underlying causes of puzzling medical conditions have been found.. UW Medicine has a long history of discovering the genetic basis behind both rare and common diseases. According to a Sept. 24, 2018, NIH press release, since opening in 2015, the national Undiagnosed Disease Network has solved more than 200 mysterious cases. “Some of these patients had previously gone to about five or six different medical centers and had a lot of testing and imaging done without any conclusive results. When they finally get a diagnosis, it is so important to them,” Jarvik said. Efforts to assist people with rare or undiagnosed diseases have been going on for many years at a number of different research medical institutions. What the NIH network does is pull many of these resources and experts together. “The Undiagnosed Disease Network also has ways for families to reach out to other families with the same disorder,” Dipple said. Those connections help the scientists and clinicians as well to better understand these disorders. What happens when an individual or family does obtain a diagnosis? Jarvik has made rare diagnoses in adults whose parents have sought answers since the patients were children. “One father cried, because for decades he had blamed himself for failing his child,” Jarvik recalled. Jarvik and Dipple encourage families and individuals to apply to the Undiagnosed Disease Network to see if their situation qualifies. During the evaluations to try to obtain a diagnosis, the network would work with patients’ own, local healthcare providers, who would continue to take care of them. 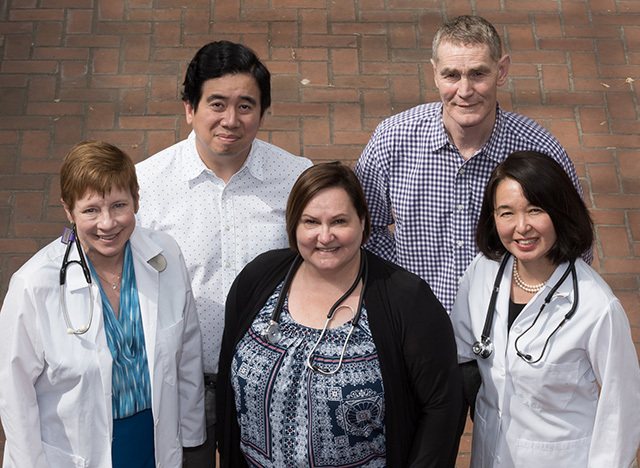 The full resources of both the University of Washington Medical Center and Seattle Children’s can be utilized for patients that come to the University of Washington Undiagnosed Disease Network site, but additional program clinical leads are Dr. Michael Bamshad and Dr. Ian Glass from the Department of Pediatrics, Division of Genetic Medicine, and Dr. Fuki Hisama and Dr. Sirisak Chanprasert from the Department of Medicine, Division of Medical Genetics. Sophisticated genomic analyses will be led by Dr. Elizabeth Blue, a scientist on the faculty of the Division of Medical Genetics, and Jarvik. “The Undiagnosed Disease Network is pioneering a new personalized medicine model for helping those patients who have historically been the most difficult for the medical community to diagnose,” said James M. Anderson director of NIH’s Division of Program Coordination, Planning, and Strategic Initiatives in today’s announcement from the NIH. “The Undiagnosed Disease Network takes advantage of cutting-edge technologies such as genomic sequencing, metabolomics and assessing patient variants in model organisms to give clinicians new, powerful information to help understand the cause of extremely rare diseases,” said Anastasia L. Wise, program director for the network in the National Human Genome Research Institute’s Division of Genomic Medicine, in the grant announcement. The five new clinical sites in Florida, Missouri, Pennsylvania, Utah, and Washington state, will join the existing clinical sites in California, Massachusetts, New York, North Carolina, Texas, Tennessee, as well as the one at the NIH unit in Maryland. National Human Genome Research Institute, the National Center for Advancing Translational Sciences, and the National Institute of Neurological Disorders and Stroke manage the Undiagnosed Disease Network awards.